These Cheesy Chicken and Bacon Quesadillas are stuffed with chopped chicken, bacon, shredded cheese, and homemade Pico de Gallo. This cheesy chicken and bacon quesadilla recipe can easily be made for an appetizing snack or as the main course. It is made with a homemade pico de gallo and can be served with sour cream and guacamole. 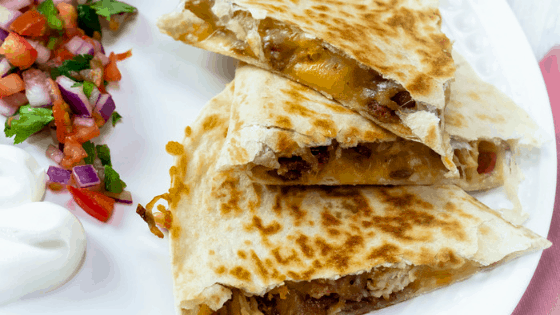 Whether it’s game night or time for dinner, these quesadillas satisfy hunger and taste buds. Stuffed inside these delicious quesadillas is homemade pico de gallo. It’s made with fresh roma tomatoes, red onion, and jalapenos. If you want an extra kick to your quesadillas, I suggest that you add at least 2 jalapenos to this recipe for the extra heat. The quickest and most efficient way to make these quesadillas is to make the chicken and bacon ahead of time. After cooking the meats, chop them up and add them into separate bowls. Creating an assembly line, place ingredients on one half burrito tortilla. Start with cheese, followed by, chicken, bacon, pico de gallo, and then top with more cheese. They’re really quick to assemble and even quicker to cook. It’s best to serve these quesadillas warm so that the cheese is melted! Quesadilla stuffed with cheese, chicken, bacon, and pico de gallo. Spray a non-stick skillet with cooking spray and heat over medium-low heat. On one side of the burrito sized tortillas, sprinkle cheese. Layer the chopped chicken and the chopped bacon. Spread Pico de Gallo evenly and then top with more cheese. Fold over tortilla and place in skillet. Heat until cheese is melted, flipping once the tortilla has browned and has become crispy.